I hear this question all the time – with so much conflicting information on the internet, it can be hard to decipher what you should be taking, and when. After all, Fibromyalgia and CFS are very challenging illnesses. They’ve humbled many a doctor. With so many different symptoms, where do you start? Well, I’ve been treating and beating fibro and CFS for over 10 years, and I’ve researched thousands of different protocols over those years. 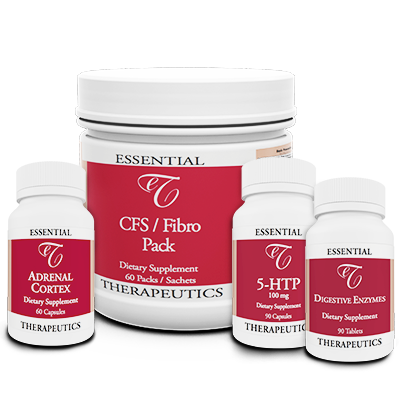 I’ve learned that the best way to beat fibromyalgia and CFS is to start with four specially formulated products. They’re designed to repair the body’s own self healing mechanisms with the goal of jumpstarting your health naturally with limited medical interventions. I realize that most individuals with FMS or CFS have tried dozens of supplements over the years. Unfortunately, these highly touted latest fad supplements have often yielded little results because they do not target the exact needs of fibromyalgia, or contain several things together that should be taken separately for maximum effectiveness. The CFS/Fibro Formula also contains all the amino acids (amino acids make the brain chemicals including serotonin), essential fatty acids in the form of fish oil (fish oil allows one brain cell to communicate with another brain cell, and reduces inflammation and depression), extra magnesium (a natural muscle relaxant, restless leg and headache preventative), and malic acid (energizes the cells and helps reduce pain). Thousands of patients have taken and benefited from taking this Jumpstart package. These 4 products taken in conjunction with each other promote deep restorative sleep, reduce pain, inflammation, depression, and anxiety. They are essential in restoring the body’s own self healing mechanisms. 5HTP promotes deep restorative sleep. Reduces pain, mental fatigue, depression, and anxiety. Normalizing serotonin levels with 5HTP usually stops IBS symptoms (diarrhea one day and constipation the next) within 2 weeks. 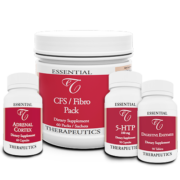 The CFS/Fibro Formula is a 5-in-one supplement pack that is loaded with the high doses of the essential nutrients including all the vitamins, minerals, essential fatty acids, malic acid, and extra magnesium (680mg). The Essential Fatty Acids reduce pain, inflammation, depression, anxiety, allow brain cells to communicate with one another, increase mental clarity, and boost energy. The Formula contains all the high dose vitamins and minerals based on The Optimal Daily Allowance according to Orthomolecular Medicine. Digestive Enzymes help stop the bloating, gas, and indigestion that go along with Fibromyalgia and CFS. These enzymes break down foods and make sure the food we eat turns into the essential nutrients we need. It also prevents any problems with digesting the fish oil in the CFS/Fibro Formula packs. Sourced from grass fed humanely raised New Zealand pigs, this high quality enzyme targets your pancreas directly to provide optimal gut health. The vast majority of my patients find great relief taking this combination of supplements. I’d love for you to be next. Learn more about our Essential Therapeutics Jump Start Package HERE.